This is a powerful book! A must read, in my opinion. 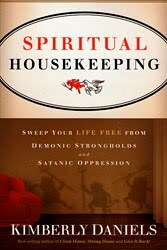 Spiritual Housekeeping will teach you not only how to break free from demonic strongholds and satanic oppression, it also tells us why it's important to do so, and what the consequences can be if we don't. Kimberly Daniels does a wonderful job of teaching on this subject. I have learned more in Spiritual Housekeeping than I did attending a 2-day class. I know that I will be reading this book again, referring back to it for reference, and passing along what I've learned.